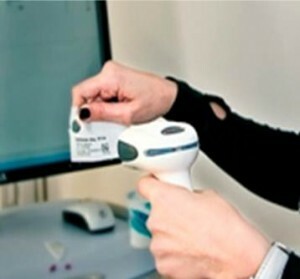 An issue I frequently encounter while assisting hospitals in planning and subsequent optimization of barcode medication administration system practices is the difficulty that many organizations have in establishing and maintaining practices related to administering medications on time or at the most clinically appropriate time. A contributing factor is the so called “thirty minute rule” – the requirement in the Centers for Medicare & Medicaid Services (CMS) conditions of Participation Interpretive Guidelines to administer medications within 30 minutes either side of the scheduled administration time. See page 174 on the CMS site for more details. For nurses in most inpatient practice settings this is of course a challenging parameter to meet. The number of patients per nurse, widespread use of polypharmacy, distance between patient and medication storage areas, patients intermittently off the floor for procedures or treatments, and the scheduled timing of doses all conspire to make to make the thirty minute rule a well intentioned yet largely unattainable requirement. Last year, the Institute of Safe Medication Practices surveyed some 17,500 nurses about the impact of the thirty minute rule on their practice. The findings provided solid numbers that supported what many of us had observed at hospital after hospital over the past few years. ISMP found that most nurses found the thirty minute rule forced them to cut corners on safety in order to meet the requirements. Seventy percent of respondents stated that they worked in an organization that enforced the rule and most strikingly, just five percent of these nurses were able to consistently comply with the rule. You can read more about the ISMP’s survey as well as the organizations most recent guidelines on medication dosing here. I’d like to overlay the findings of ISMP’s survey with the realities of bedside barcoding medication administration (BCMA) practices. Prior to experiencing the transition from paper to electronic medication administration documentation, many people wrongly feel the use of these systems will “save time”. Of course, any nurse that has relied on a paper kardex and paper MAR before transtioning to an electronic BCMA system knows differently. While the safety benefits of BCMA are undeniable, nurses are often confronted with seemingly difficult choices between getting their job done within the confines of the thirty minute rule and practicing safely. Of course, prior to the implementation of a BCMA process, it is highly likely that nurses facing a time crunch were able to employ unsafe practices that would go undetected. However, in environments with automated dispensing and bar-coding technology, these practices become more apparent. Examples include nurses removing meds for multiple patients from Automated Dispensing Cabinets at one time, pre-scanning medications that might not be administered within 30 minutes and putting them aside until actual administration can occur. Pre-scanning is an extremely dangerous workaround and is tantamount to false documentation, but sadly, it is not altogether infrequent and its prevalence is entirely a product of factors such as the thirty minute rule. It is more common in punitive health-system cultures and those where medication administration practices and times have not been optimized. There are many more workarounds related to BCMA and the thirty minute rule but I’ll comment on some of the others in future blog entries. While it may take either slightly longer or the same amount of time to document medication administration using BCMA, virtually every nurse I have spoken to in my many years of helping hospitals plan for and optimize these systems will attest to the fact that they have been prevented from making a medication error on multiple occasions because of the system. Such is the power of BCMA that for all the process, build, equipment selection and financial considerations hospitals must make to successfully implement them, they are ultimately worth every penny spent and ounce of effort expended. In conclusion then, it is my opinion that the thirty minute rule in most practice settings hinders rather than enables the safe medication administration and accurate documentation. Unless it becomes no longer relevant (i.e., repealed), health-systems should optimize their medication administration times, obtain feedback from frontline clinical staff and develop strong measurement and metrics to evaluate their ability to meet expectations. Edited 7/24/11 to add: Pharmacy Practice News, in its July 2011 edition has an extensive article on the 30 minute rule. If you are a registered user, you can read it here. We don’t have 24 hour pharmacy service at my hospital and the 30 minute rule as you call it is a real problem for us in the mornings. It is virtually impossible to get meds up to the floor or released from our Diebold machines before 9:00 med pass. My department is a 24 hour pharmacy but even with full pharmacist coverage, Pyxis at each end of every nursing unit, tube system and hourly technician deliveries there is little we can do to help nurses meet the 30 min rule. It is an impossible parameter to meet and MUST be changed.